Register Today for Prospect Plus! We are excited to host our 3rd year of Prospect Plus Girls Lacrosse Camps. At Prospect Plus we bring some of the top college coaches in Divisions 1, 2 and 3 directly to you. This camp is open to the general public and due to NCAA rues there are no discounts (except for Early Bird Signup) or scholarships available. Go to our Online Registration Page on our WELCOME PAGE to REGISTER TODAY! 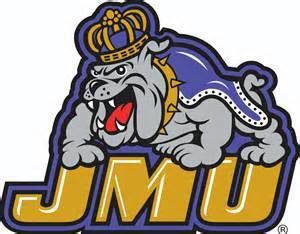 Please join new JMU Goalie Coach Kerry Stoothoff (Loyola University '12) as she comes back to Long Island for this small group training session. Coach Stoothoff was a 4 year letter winner at Loyola and was a Two-time Tewaarton Award watch list selection. 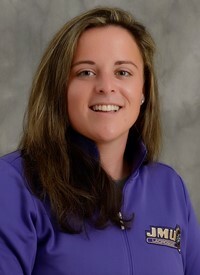 Coach Stoothoff also plays in the professional ranks as the starting goalkeeper for the Baltimore Ride of the United Women's Lacrosse League, which celebrated its inaugural season in 2016. Please join new Head Coach Katrina Dowd (Northwestern '10) and her assistant coaches Michele Tumolo (Syracuse '12) and Becca Block (Syracuse '13) as they come East for their 1st ever clinic on Long Island. Katrina Dowd was named the second head coach in Oregon lacrosse history on June 15, 2016, bringing with her elite credentials as one of the best players in women’s lacrosse history and a championship coach. Dowd joined the Ducks after spending four seasons at North Carolina as the offensive coordinator and draw specialist coach, helping lead the Tar Heels the their first ever national title in 2013 and a second title in 2016. With Dowd at the helm of the offense, the Tar Heels ranked No. 5 in the nation in scoring with 13.59 goals per game in 2016, and No. 8 in draw controls per game with 13.41. As a player, Dowd is cemented as one of the top offensive players in international lacrosse history, scoring a World Cup record 26 goals in 2013 to lead the U.S. to a gold medal while earning All-World honors and the distinction of Best Women’s Player for 2013 by Lacrosse Magazine. Dowd was a member of the U.S. national team from 2008-14. In her collegiate playing career, Dowd was a three-time NCAA champion at Northwestern and finished her career as the all-time NCAA Tournament leader in goals (45). Dowd claimed first-team All-American honors during her junior and senior seasons and was named the 2010 IWLCA Attacker of the Year and Tewaaraton Award finalist as a senior, finishing the season with 110 points on 77 goals and 33 assists. Michelle Tumolo officially joined head coach Katrina Dowd’s staff on July 5, 2016. Tumolo brought with her a decorated career as both a player and a coach as she arrived in Eugene to help coordinate the offense for the Ducks. Tumolo came to Oregon after three seasons as an assistant coach, spending 2016 with Syracuse, her alma mater, after two years at Florida. The Orange finished 2016 with 314 goals under Tumolo’s guidance, second-most in the nation, just one season after Tumolo helped Florida lead the NCAA in scoring with 15.52 goals per game. Prior to joining the Gators as a coach in 2014, Tumolo enjoyed a decorated career as a player at Syracuse from 2010-13. Tumolo played in the Final Four three times in four seasons and, like Dowd, was a finalist for the Tewaaraton Award as college player of the year in 2012. Becca Block joined the Ducks as an assistant coach on July 20, 2016, bringing with her a decorated resume both as a player and a coach. 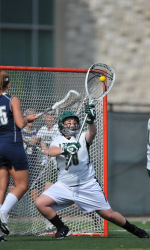 As a player, Block is one of the premier defenders in women’s lacrosse. She has played five years with the U.S. National Team after first making the team in 2012, and was the 2013 IWLCA Defender of the Year and an All-American as a senior at Syracuse. During her four-year college career, Block helped lead the Orange to the national title game in 2012 and a Final Four berth in 2010, while Big East All-Academic honors twice. Lunch - we will break for lunch each day around 12pm. We are looking forward to a great week of camp! 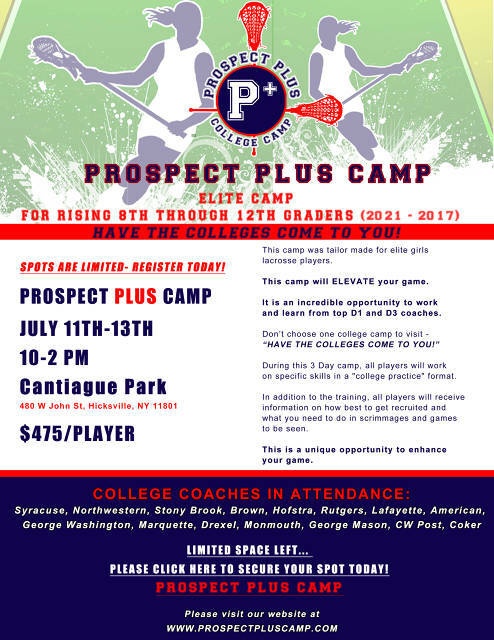 ﻿We are excited to host our 2nd year of Prospect Plus Girls Lacrosse Camps. 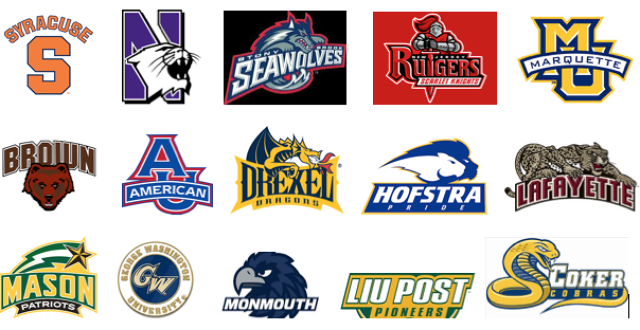 At Prospect Plus we bring some of the top college coaches in Divisions 1, 2 and 3 directly to you. This camp is open to the general public and due to NCAA rues there are no discounts or scholarships available. What is the PLUS in Prospect Plus? * What is the best way to get SEEN - tournaments, camps, showcases or clinics? Our coaches are here to not only TEACH your daughters but also educate them on the recruiting process and give them KNOWLEDGE to help them get the most out of the process.